Every Microtel Hotel has its similarities, especially when it comes to its distinct architecture, classy interiors, chiropractor-approved mattresses, and room configurations (amongst other things). But for every Microtel property in the Philippines, each one is still very different from the other, just like Microtel Tarlac. While strategically positioned to serve the needs of nearby companies, this international brand also serves as a venue for both rest and recreation. I’ve stayed in other Microtel properties before (i.e. UP Technohub, Acropolis, General Santos). But it was my first time to try their inn in Luisita, Tarlac City. Thanks to our friends at Microtel North Luzon, my friends and I were able to experience the very first Microtel Hotel in the Philippines. Microtel by Wyndham Tarlac is a 50-room hotel that is located inside Hacienda Luisita (not too far from the Robinson’s Complex and Aquino Center and Museum). 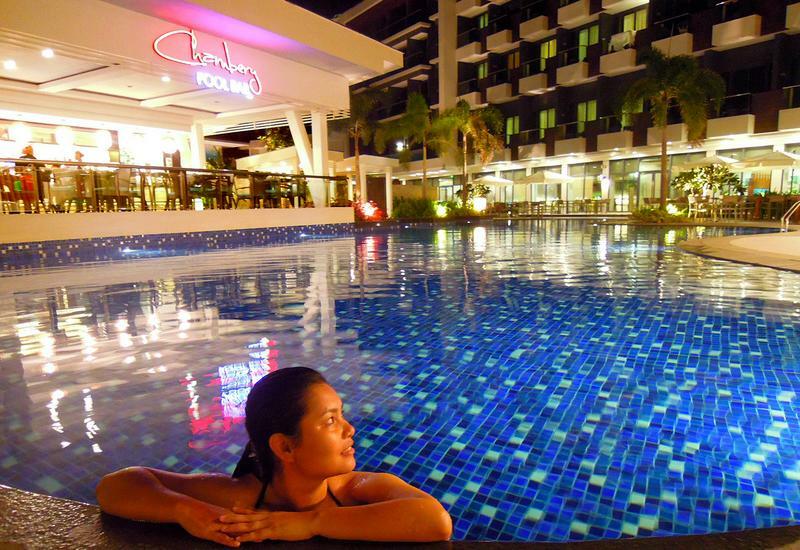 Whether you’re in Tarlac City for business or leisure, the noteworthy establishment is sure to provide you with spacious accommodations that will make you feel relaxed and comfortable throughout your stay. I usually stay in a 2 Queen Beds Room (comes with a 32” Flat screen Cable TV, individually controlled A/C unit, IDD/NDD phone, toilet and shower with hot and cold water, hair dryer, radio clock, window seat, fully automated fire safety system). But this time, I finally got to try their 1 Queen Bed Suite, and it was a pretty nice experience. The Suite had everything that all the other bed rooms had and more! It had its own coffee making facility, refrigerator, microwave oven, kitchen counter with sink, sofa sleeper and bath tub. The sofa sleeper in our room was converted into a make-shift bed, which we no longer got to use since the Queen Bed was big enough to accommodate my friend and I. Unlike all the other Microtel properties that I’ve stayed in, Tarlac’s hotel still used regular metal keys to access the rooms, which took some time getting used to (there were certain twists needed to open the door). Hopefully, they’ll be able to replace the old mechanism by using the current electronic keycard entry system. But other than that, our stay was pleasant all throughout. There were also plenty of highlights during my stay in Microtel Tarlac, like the convenient location of the hotel, as it was just a short distance from the Robinson’s Complex (plenty of food outlets to choose from) and the Aquino Center & Museum. It was also a short drive to Luisita Golf & Country Club, Central Azucarera de Tarlac, and Kart City Tarlac. I also loved that the countryside inn is nestled in a safe and quiet place, despite being just a few minutes away from the busy thoroughfares of the city. I also loved the fact that a 24-hour vending area was accessible to us. They even have a Nescafe coffee dispenser that poured different flavors, which can all be availed for free. But that’s not all! They also allotted water stations on every floor, so you won’t have to go thirsty at any time of the day. So what else is around? 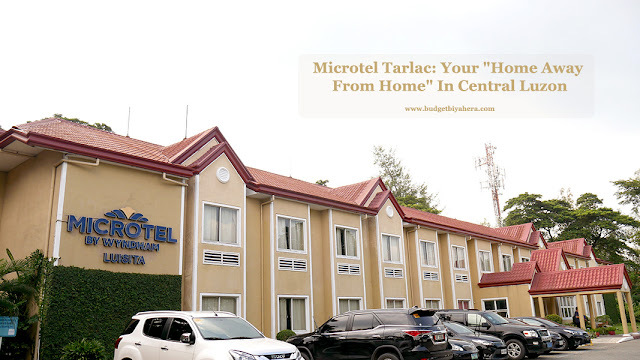 Microtel Tarlac also offers a cozy lounge, wireless Internet access, non-smoking rooms, accessible facilities, ample parking space, massage (on-call), photocopy, fax and mailing services, and a scheduled shuttle service within Hacienda Luisita (free from 6 AM to 10:30 PM, with prior reservations). From North Luzon Expressway (NLEX), enter Subic-Clark-Tarlac Expressway (SCTEX), and take the rightmost lane going to Tarlac-Baguio. Exit at Luisita, turn right and go straight along Luisita Access Road. You’ll find the hotel to your right, before you reach MacArthur Highway. Microtel Tarlac can also show you around the city. Their very accommodating team can even take you as far as Mount Pinatubo or Monasterio de Tarlac. So should you wish to explore the province of Tarlac, don't hesitate to inquire about their rates and schedules. Microtel as a whole offers nothing but reasonably-priced accommodations (with well-trained staff too! ), and shows nothing but international standards of quality and warm hospitality. It truly is the same great hotel everywhere you go.